Forrest Fang, a Chinese-American multi-instrumentalist par excellence, belongs undoubtedly to the world's most innovative electro-acoustic sound explorers. His phenomenal double album from June 2016, "The Sleepwalker's Ocean", still deeply resonates, but the time flies fast and this, in San Francisco Bay area based virtuoso, has released in the meantime another three masterful albums. First of them is "Following The Ether Sun" album, which was released February 2017 on Projekt, the CD is packaged in a 4-panel digipak featuring splendidly beautiful cover art by Kinga Britschgi, a graphic designer and digital artist from Idaho, who has already graced with her creative wizardry above mentioned "The Sleepwalker's Ocean" album. The credit list include Robert Rich as the mastering engineer and Sam Rosenthal taking care of additional graphic design. A very strong line-up indeed, more especially if you take into account also lengthy list of featured instruments from all over the globe, but that's nothing surprising for a maestro if this caliber. "On The Edge Of A Moment", clocking past seven and a half minutes mark, immediately ignites this extraordinarily rewarding collection with luxuriantly fragranced kaleidoscope of many spirited acoustic instruments, ranging from lushly euphoric violin to narrative strings, from glimmering bell titillations to remotely galloping rumbles. Mesmerizingly enveloping and distinguishably scented, a pure aural bliss!!! "Midnight Rain" takes the listener into soothingly immersing expanses gently permeated by shimmeringly evocative quietudes, what a beauty! Subterranean drones announce "Chiaroscuro", meditatively flickering tinkles commingle with cinematically nuanced layers and intangibly glancing gossamer organics. During the second half exotically stringed ear-tickling subtleties steal the forefront. Tranquil elixir! "The Last Technicolor Dream" unfolds with abysmal meridians, which soon metamorphose through ambiguously serpentine echoes to blossomingly dazzling fusion of tribal and world music infused rhythms. Exhilaratedly engrossing! "Hinterlands" keeps on the path of richly perfumed palette, where flamboyantly multi-cultural and venturesomely textured sonorousness meticulously amalgamates with bizarrely fascinating laid-back downtempos. Yes, all these are exquisite signatures exhibiting highly accomplished musicianship, Forrest Fang at the very top of his ingenuity! "Receding Pool" glides into balmily engulfing realms, illuminated by halcyon piano glimpses and precisely interacts with its title. A charming piece! "A River In Retrograde" remains orbiting through ethereal expanses for some time, but then swiftly transmutes back into enchantingly expressive and magnificently piquant domains owned by Forrest Fang. 17-plus minutes long epic "Left Of The Sky" closes this remarkable album with serenely drifting stratums, reinforced by diaphanously tinkling embroideries and vague transcendental fragments. 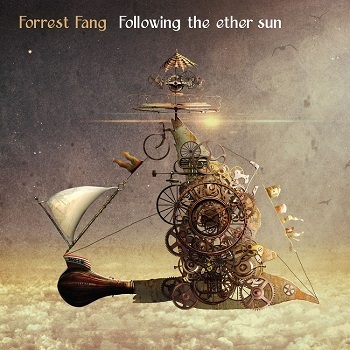 73-minute "Following The Ether Sun" album is another outstanding release by Forrest Fang. His consistence in delivering gems filled with his trademarking multifarious ingredients is just amazing, and as always, each of these journeyings is magically transporting for each dedicated listener. "Following The Ether Sun" is no exception! And don't miss also the next album "Scenes From A Ghost Train", which was released exactly one year ago as well as the newest one entitled "The Fata Morgana Dream", the official street date for this one on Projekt is February 8th 2019, so keep on exploring!! !